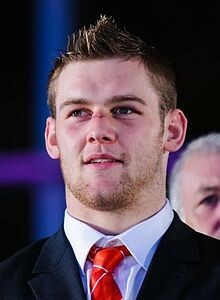 Welsh flanker Dan Lydiate grew up on his family’s farm near Llandrindod Wells. A product of the Newport Gwent Dragons Academy, as a teenager he was an important member of the Wales Under 20 back row, later progressing to the Dragons’ senior side. Then in 2008 he suffered a serious neck injury in the Dragons’ Heineken Cup Group match at Perpignan, which threatened his playing career. A year later he made his debut for Wales in 2009 and quickly established himself as a key member in Wales quarter final World Cup. In 2012 he was named Player of the Tournament after Wales won the Grand Slam in the 2012 Six Nations Championship.